2015 was benchmark year for March Studio; we went from (M)Arch. to March for one. Here is a look back and ahead, at the start of 2016. This path of discovery began almost a year ago in February 2015 at the Zag! Conference led by Marty Neumeier. It was an opportunity to work with a longtime mentor on refocusing ourselves and gaining collective insights from creative professionals in the same boat. It helped us to articulate what we do and have been doing for a long time. We had been shy about it. “You gotta own it,” our colleague, Reed Kroloff then Dean of Tulane told us. We had been down this road about 10 years ago but never pulled the trigger. “Trust in the You of Now,” said Brian Eno. The timing was right; we were in a coming of age moment. “I loved collaborating on our own brand; it was such a privilege to have someone come in to simplify and clarify our message,” Sherry reflects. We spent a lot of time looking for the right partner and found it with Flux Branding. It was a six month journey together and our collaboration went through a couple of stages (self assessment, brand development). “Now I think we are at celebration and implementation,” Todd states. It was great for Flux to see us celebrate our brand identity at our rebranding launch event after working with us through the earlier discovery phases. The aftereffect of this rebrand project has been a strong sense of renewed energy. “I got this wave, walking into our studio, of positivity and possibility. I can do anything in this space,” describes Sherry. There is the surprise of feeling ready for anything after 15 years of doing what we do. After working with Vice in 2014, we developed a confidence in our ability to create bigger branded projects. We learned a lot from Motorcar Parts of America Innovation Center partnering again with Flux Branding on a project that was 50% branding and 50% architecture. Applying the strategies developed in that commercial project to a community project like Providence High School let us work collaboratively with the client in a new way on the branding aspects of our concept. 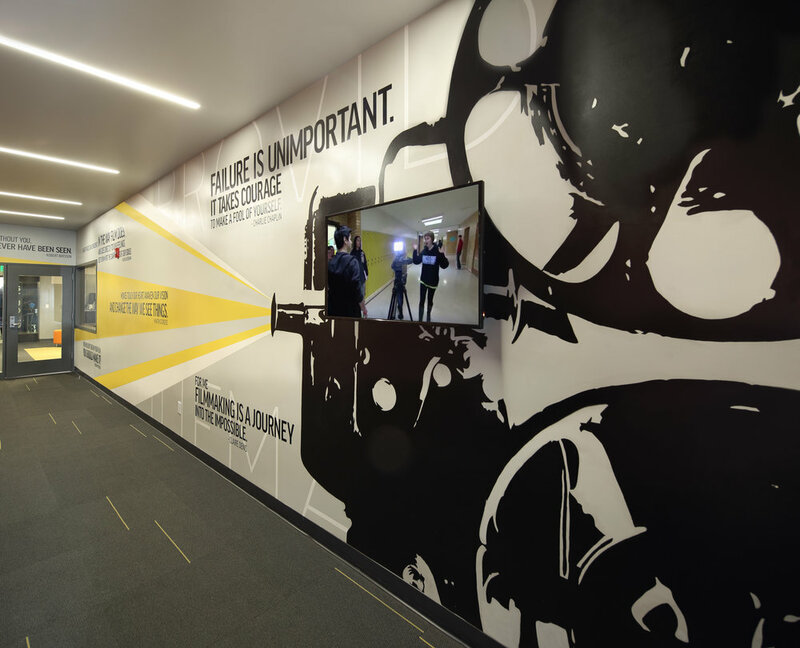 We were able to create inspirational murals and heavily graphic work with them on a smaller budget to infuse brand recognition to our design. In teaching, the Designmatters course Sherry led with Nike was invigorating. “I had taught other Designmatters courses at Art Center before, but this had such a vast and complex brief. All the subsequent attention and awards for the work is so encouraging not just for the students but for us as well,” says Sherry. Internally at March Studio, bridging the gap in the office between the branding and architecture through new hiring of LJ with a background in both fields has helped align the conversations we have about projects. We have found that we really want to be a resource for our clients. We make an effort to be experts in our fields so that we can add value beyond the specific projects. Focusing less on selling the work and selling the relationship with our clients. We have so many long term and repeat clients that we have developed great collaborations with. We are learning to embrace our strength in being longterm partners for our clients. There is so much to be excited about in this new year. “I am excited about teaching architecture again – this time with Lara at Woodbury University. It will give me the opportunity to test some things with the students,” says Todd. The class itself is interesting because it is an actual professional project brought into academics by request of the client. It was initiated by and comes from a level of trust in our long time collaboration with Tadashi Shoji. Another exciting venture is the expansion of our international work with the opening of the Tadashi Shoji Store in Doha. With Lara, our Design Director, from London we are always exploring how to engage more international clients. Domestically, a ground up school building we are working on for Sterling will be finished this year. It brings together our strengths in creative office design and education design. It is exciting to leverage those strategies and will be great to see it completed. Internally, we are focused on adding value to our work. Being able to better compensate our employees for their work and the value they bring to the studio. This requires us to think about profit and how to be efficient with our working hours. “Early on, I had the benefit of great bosses that just let me go with my passions and interests,” says Sherry. We want to leverage the unique capabilities and strengths of everyone in the office. While adding value for our employees is important another aspect we deeply care about is adding value to our community. We always maintain the ability for March Studio to have pro bono clients and build with our communities. This will be the third year the Erlandson family has gone down to Haiti to build, donating time, but we are exploring if there is a way for us as an office to contribute. We are always evolving, both in our professional and academic work. Another year down and there has been so much growth and development for us as a studio. 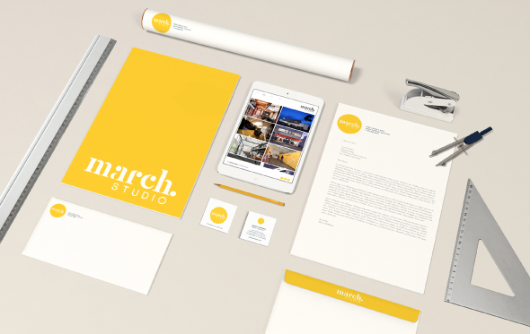 We are determined to take this renewed vitality and spirit of our March Studio brand and spread it internally through all our projects and collaborations with branding and design partners and clients. This is the stuff we love to do, with people we enjoy working with, and we have a whole new year to continue. Best of luck to you all in 2016!